Real Rosé. Not a afterthought, not leftovers, not for fashion and most decidedly not a saignée, Corallina Syrah Rosé is Napa Valley rosé with a purpose. It is a wine made as mindfully as we make any other wine. While a saignée may be a wonderful idea in the coolest years in the coolest regions like Burgundy and Oregon it is a very strange concept in a warm region like the Napa Valley. Do you really think its a good idea to concentrate Napa Valley wine more than Mother Nature already does? Yes, I know Robert Parker thinks so, but I don’t. So Corallina Syrah Rosé is a mindful rosé and we keep these Oak Knoll AVA Crane Vineyard vines in a state of serene rosé-ness throughout the growing season. Each of these syrah grapes are in a state of serenity and inner pinkness from the moment of bud break until, just twelve months later, they become Corallina Syrah Rosé. This is fruit destined to be a rosé all the way from flowering to bottle. As these syrah grapes arrive at the winery already having achieved enlightenment, it is our job to ensure that when you and Corallina come together that Nirvana is the result. To be sure this is the case we keep our hands off Corallina as much as we can. Mere hours after harvesting the cool fruit arrives at the winery and immediately goes into the press. This is whole cluster pressing and a key part of Corallina’s centered personality. In California saignée is the shady ying to the sunny yang of whole cluster pressed rosé. The whole bunches of grapes that will be Corallina go into the press and over a slow, three hour press run these syrah grapes gradually reveal their pink soul. The juice goes immediately into a stainless steel tank where slowly, very slowly due to the cool temperature, it ferments to complete dryness. Then the new Corallina is racked into mature French Oak barrels for five months of meditation before it fulfills its destiny when the Corallina Wine Dance label finally adorns its bottle - just in time for summer. Inner wine peace cannot be achieved with mass production so only 500 cases or so of Corallina Syrah Rosé are produced each harvest. This year Mother Nature gave us a Corallina with 13.8% alcohol, TA 0.54 and 3.50 pH - isn’t that riveting. More importantly she gave us our most delicious Corallina yet and we could not be more grateful and humbled by her gift. Finding Nirvana will be a bit easier this summer due to the 2014 Cornerstone Corallina Napa Valley Syrah Rosé. State dinner wines: a lucky 8 for Shinzo Abe? There was a state dinner last night at the White House–the eighth for the Obamas–in honor of visiting Japanese PM Shinzo Abe. About 200 people attended, new china was revealed (above), and “Iron Chef” Masaharu Morimoto was in da haus. Recall that Obama and PM Abe ate at the counter of sushi master Jiro Ono last year, so they clearly like good food. But what vin-quiring minds want to know is…what were the wines? Would this be a lucky 8 for PM Abe given the lackluster wines the White House wine steward served previously? While Sonoma is a wonderful place, It’s not clear what was driving Daniel Shanks, the White House Usher, in featuring the all-Sonoma lineup: there are other great places making wine in America. I personally would have included a domestic dry riesling as a white because there are some good ones now; they are also spring-y and pair well with Asian foods. And Luc Morlet, wow, one of his wines hasn’t been featured since…oh, last year’s dinner for Francois Hollande. Again, same comments as Sonoma: there are a lot of great pinot noirs being made in the US, so why the repetition, Mr. Shanks? And Iron Horse is frequently served (btw, this specific wine is not on their web site so it could be a sweet sparkling wine, which Shanks has served previously). The post State dinner wines: a lucky 8 for Shinzo Abe? appeared first on Dr Vino's wine blog. More acres of grapes are now in China than France. The total vineyard area in China is 1.97 million acres (799,000 hectares) according to new stats presented yesterday in Paris by the OIV, the International Office of Vine and Wine. The US remains the world’s largest wine consuming country. Check out our interactive chart below–be sure to click to see whether each market is growing or shrinking! The post China’s vineyard area vaults past France appeared first on Dr Vino's wine blog. 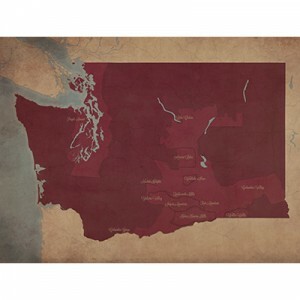 City Prints has a way for you to show your love for wines of different areas including Washington. Who doesn’t enjoy a glass of wine?! Wine let’s you cheers with friends and family, party out on the town, or wind down from a busy day at work. Now you can enjoy that glass of wine while knowing exactly where it came through with our new Wine Regions series. Members of the New York Times wine club residing in New York are not receiving wine–and shipments might not resume until July. The Albany Times Union has a detailed account of the wrangling that has led to the suspension (indeed, on the NYT wine club site, New York is not even an option for sign-ups–the wine club continues in other states). The NYT wine club is run by a group called Global Wine Company and does not, as the Club’s web site states, make selections with the NYT wine critic or members of the newsroom. The Club offers six-bottle shipments for $90 or $180 on various monthly schedules. Global Wine Co also fulfills the club shipments for the Williams-Sonoma, the Washington Post and Food & Wine. The Times Wine Club told its New York subscribers last week that it would have to suspend shipments until July because of uncertainty over New York’s rules and regs about shipping. However, the State Liquor Authority spokesperson told the Times Union that the Club’s local retailer had stopped doing business with them since Global Wine Co, based in California, had received cease-and-desist letters. I’m not a huge fan of wine clubs in general–I’d opt for spending a monthly budget at a local store where the wine discussion is free and you have more choices to get exactly what you want. But there’s no reason that New York consumers should not be allowed to subscribe. While this particular incident revolves around the Gray Lady, what consumers and businesses need is to get out of a gray area: hopefully the new head of the NY SLA will clear the air and issue understandable guidelines for businesses to ship into and out of the state. The post New York Times wine club on ice appeared first on Dr Vino's wine blog. It’s no secret that I usually have a crowd of people hanging around, whether in the garage or inside listening to vinyl records on the hi-fi. When wine consumption shot higher in 1994, little did wine consumers know that they were uncorking one of the greatest bull markets in recent history. Every year since then, wine consumption has grown making the wine boom now 21 years old–old enough to buy itself a drink, legally, were it a human. But the growth, which slowed in the wake of the recession, has lost steam but continued to edge higher. Last week in New York City, John Gillespie of the Wine Market Council, a non-profit trade association whose mission is to grow the wine market, presented data on the latest trends. From 1994 – 2007, only one year had less than 2% growth, the recession year of 2001. But since the Great Recession starting in 2008, although every year has seen growth, the growth has been slower with only one year exceeding 2%. Why is growth slowing and what does it portend? These were the main questions behind the presentations. Growth is slowing because of the rise of craft beer (not exactly hard to see coming), but also, Danny Brager of Nielsen said, because some consumers are trading up, drinking less but more expensive wine. Brager also pointed out that beer consumption is in secular decline having fallen from 60% of the market share of alcoholic beverages in the US in 2000 to 52% last year–and much of the rise of craft beer is at the expense of big, boring beer. He also said that of the 125 packaged goods that Nielsen tracks, growth is sluggish across the board, so wine is outerforming 90% of them. As to the future, John Gillespie wondered if the wine market is at a tipping point, which could spark a return to strong growth, or a turning point, which would point downward. While he didn’t come down on either side, the sinister organ music playing in the background, releasing a murder of crows into the auditorium and eerie sound of a creaking door slamming all led to a general impression. (Ed. note–dramatization.) We shall see what happens over the next year but if I had to guess, I’d predict more of the same slow growth. Of course, the best way to really boost consumption would be to lower prices. And the only way that would happen is a legal change, such as eliminating the mandatory three-tier system and its layers of markups. Chance of that happening: infinitesimal. See more stats from the presentations over on my Twitter feed. The post The wine boom turns 21 – but is acting aged appeared first on Dr Vino's wine blog.